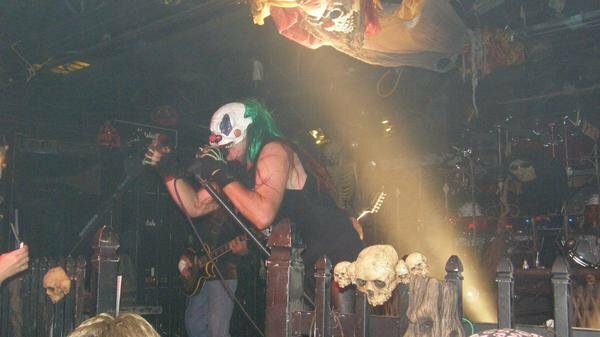 Halloween is a TRUE heavy metal band from Detroit, Michigan. It was formed in 1983 by members Rick Craig, Brian Thomas, George Neal, and Bill Whyte. Their debut album Don't Metal with Evil was released in 1985 on the Motor City Metal label. It was and still is a legend in the Detroit metal circuit and around the world. In 1986, Halloween started work on their follow up to Don't Metal With Evil, Victims of the Night, but it was shelved until it was finally released on Molton Metal Records in 1997. Bill Whyte and Rick craig were replaced by future Godsmack drummer Tommy Stewart and guitarist Billy Gray. In 1989, Halloween opened for Crimson Glory on a couple of dates on their Transcendence tour. In that same year, Halloween began work on a new album with Jon Drenning of Crimson Glory and Warren Wyatt management. The album never made it to the shelves. In 1990, Halloween recorded a 5 track demo entitled Vicious Demos . In 1991 No One Gets Out Was released. In 2006, the album Horror Fire and E.vil P.ieces were released. 2010 PURE STEEL Records in Europe released the Re-Mastered versions of Don’t Metal With Evil and Victims Of The Night and had previously re-released the Don’t Metal With Evil LP. The band has currently finished their newest album TERRORTORY which is scheduled to be released on February 25,2012. …. "The most famous un-signed band in the world"...A never ending testament of persistence, endurance and tenacity. What once was...still is and forever will be... With the release of TERRORTORY, they continue their legacy as one of metal's premiere, underground acts. Screaming from the speakers, come tales of temptation, torment and mystery, years of pent up energy and life changing experiences, as the macabre' imagery overloads your visual senses. Twisting and turning through the maze of subject matter that is horror... Loud, proud and unconditional this band rocks to its own set of rules. Rock, Metal, New Metal, Death Metal, Doom, Speed Metal, Gothic, Classic, Old School, Hair Band, whatever you need to call them, just make sure you call them Halloween...and call on them often...Influenced by the obvious as well as the obscure. It's easy to generalize and assume the origins and intent of this now 5 piece metallic machine. (But you know where, that will get you...) Looks like... horror, sounds like...Halloween. A dark and ominous and intense stage show that has grown to epic proportions over the years. A show that started from simple beginnings (just decorations on the wall), now world famous and still highly sought after, along with a collection of metal masterpieces that have stood the test of time and number in the hundreds.”..